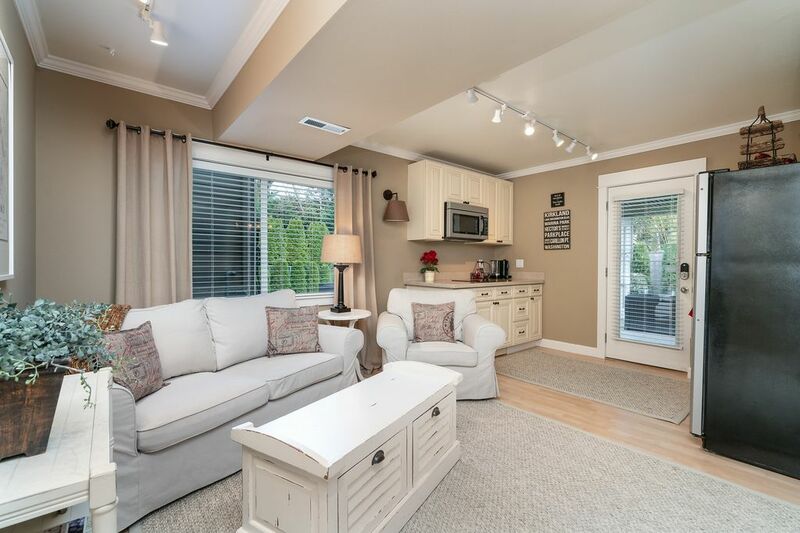 All the comforts of home await you in our quiet 1 bedroom 1 bath apartment on a private lane in downtown Kirkland. Kirkland is an upscale 'beach town' located 15 minutes East of downtown Seattle on Lake Washington. Lots of parks, shopping, bistros, coffee shops, art galleries, boating, hiking and much more. Our little cottaqe is a great alternative to the Heathman Hotel and The Woodmark Hotel's that are nearby. Camera on parking area for guests auto security. Window in the living room looks out to private patio and garden. All new cabinets, lighting, limestone countertops, travertine - spa walk in shower. Fully stocked kitchen, luxury linens/towels, Spa Robes, Hair dryer, curling/flat iron, Iron/Board, FREE Wi-Fi, full cable, air conditioning for summer comfort. Private covered patio and new additional flagstone patio was also just added for our guests outside enjoyment. Read a book, relax outside on the comfortable lounge chairs. BBQ and have dinner on your private patio. Parking for 1 car is included. Come, stay and enjoy all that Kirkland/Seattle and Woodinville Wineries have to offer! We hope you enjoy the changes! We purchased this property in 2011 and love living here. We enjoy having the little downstairs apartment for family and friends to stay. We have met some wonderful people that have stayed in our place. We looked for quite a while before we found this perfect location for us. It is on a private lane, yet in the middle of downtown Kirkland. Our little MIL apartment is perfect for those that want to get away and yet feel like they are still at home. It is private and you can come and go as you please. It is a downstairs apartment that is part of our home on a private lane. There is a private little patio off the back to sit and drink coffee or a nice happy hour in the afternoon. Walk to all that downtown Kirkland has to offer, take in all the nice Wineries in downtown Woodinville, or a 20 minute drive to downtown Seattle to visit Pike's Market and all the fun activities of downtown. We are an hour and a half from Crystal Mountain Ski Resort, Stevens Pass which are both great Ski Areas. The San Juan Islands are close for beauty, whale watching, and wine tasting at some of the local wineries on the Islands. If you want to go biking/hiking, there are lots of wonderful hikes and bike trails close by. Of course if you need retail therapy...I can give you all the inside scoop on that! We hope that you enjoy your stay with us and feel comfortable and at home. 2 person Max. NO SMOKING! Fully stocked bathroom with soaps, shampoo, conditioner,blow dryer, flat iron, robes and thick and thisty towels. There are also misc items in case you have forgotten some toiletries. Not in the unit, but available to use. Parking provided for 1 car. Camera added for additional security feature. Starbucks Verisimo coffee maker, creamer, honey, sugar provided for morning coffee and tea. Outside on private patio seats 4 at the table. There is a lovely flagstone patio with comfortable deck furniture for visiting. We also have Apple TV which gives you access to Netflix with your own password. TV channels is full cable and also HBO, Showtime and some other movie channels. Steven's Pass, Crystal Mountain, Snoqualmie Pass all within 1.5 to 1.45 hour drive. Whistler BC 5 hour drive. Our goal is to provide a wonderful experience for our guests. If you have any questions regarding items that are provided in the unit, please feel free to give us a call. Fantastic place-clean, very comfortable, and ideal location. Would definitely stay here again. This place is so beautiful we didn't want to leave! Our reason for traveling to the area was to spend time with our kids and grandkids. We began each day warm and cozy with a great cup of coffee in a gorgeous setting. We filled our days with family and fun in Kirkland and retreated each evening to all the comforts of home. Both the MIL and Carriage House are impeccably kept with stunning decor. They are comfortable, warm, quiet and extremely clean. We always look forward to coming back. Very comfortable and quiet. Convenient location within walking distance to downtown Kirkland. Outdoor space would be nice to use in the summer. Great property in quiet neighborhood location. Clean, comfortable and convenient. The apartment is fully furnished, kitchen is stocked with essentials and refreshments. Jill and Rick are like good neighbors. The backyard is beautiful with blooming flowers. Nice and quite sitting out there in the morning with a cup of coffee or tea (donuts will be a bonus). The bed is comfortable, bathroom is very nice and also stocked, good shampoo ( I am picky about shampoo). Thank you very much. We had a good time. Charming retreat nestled in a beautiful neighborhood. Very clean, very comfortable, beautiful grounds...the property exceeded our expectations and we had a great time. We look forward to staying again on a future trip. For a full refund, cancellation must be made 30 days prior to listings local check in time minus VRBO fee. For a 50% refund, cancellation must be made 7 full days prior to listing's local check in time If the guest cancels less than 7 days in advance, there is no refund made. If guest leaves early, nights not spent are not refunded.